November 2, 2010 - Average domestic air fares rose to $341 in the second quarter of 2010, up 3.8 percent from the average fare of $328 in the first quarter in the fourth consecutive increase from the previous quarter, the U.S. Department of Transportation's Bureau of Transportation Statistics (BTS) reported on Monday. During those four quarters, fares increased 13.1 percent after falling to a recent low of $301 in the second quarter of 2009. BTS, a part of the Research and Innovative Technology Administration, reports average fares based on domestic itinerary fares, round-trip or one-way for which no return is purchased. Fares are based on the total ticket value which consists of the price charged by the airlines plus any additional taxes and fees levied by an outside entity at the time of purchase. Fares include only the price paid at the time of the ticket purchase and do not include other fees, such as baggage fees, paid at the airport or onboard the aircraft. Averages do not include frequent-flyer or "zero fares" or a few abnormally high reported fares. The $341 second-quarter 2010 average fares were down 4.8 percent from the all-time high, not inflation-adjusted, of $358 in the third quarter of 2008. Second quarter 2010 average fares were up 13.1 percent from the post-9/11 second-quarter low of $301 in 2009, not adjusted for inflation. Adjusted for inflation, second-quarter 2010 fares in 1995 dollars were $238, down 21.1 percent from the average fare of $302 in the second quarter of 1999, the inflation-adjusted high for any second-quarter since 1995. BTS air fare records reach back to 1995. See BTS Air Fare web page for historic data. 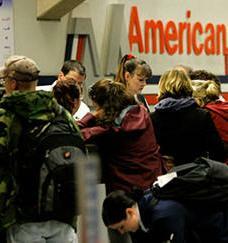 Passenger airlines collected 70.9 percent of their total revenue from passenger fares during the first half of 2010. During the full year 2009, the percent of revenue from fares was 70.2 percent, down from 84.1 percent in 2000. Air fares in the second quarter of 2010 increased 0.5 percent since the second quarter of 2000, compared to an overall increase in consumer prices of 26.4 percent during that period. In the 15 years from 1995, the first year of BTS air fare records, air fares rose 14.8 percent compared to a 42.9 percent inflation rate. In 1995 dollars, the average air fare in the second quarter of 2010 was $238, compared to $297 in 1995 and $300 in 2000. Five highest and five lowest average fares in the second quarter: Huntsville, AL, had the highest average fare, $485, while Atlantic City, NJ, had the lowest, $178. Five largest increases and five largest decreases from the second quarter of 2009 to the second quarter of 2010: Charleston, SC, had the largest increase, 24.5 percent, and Grand Rapids, MI had the largest decrease, 6.0 percent. Five largest increases and five largest decreases from the second quarter of 2000 to the second quarter of 2010: Dallas Love had the largest increase, 47.0 percent, and White Plains, NY, had the largest decrease, 47.2 percent. Third-quarter 2010 average fare data will be released on Jan. 26, 2011.